Last year I bought some Halloween decorations for 90% off. I spent very little money, and did not buy anything of great quality, so if they only last for one year it will be ok. Troy has been waiting for Halloween to get here for the past 378 days so he can put out the decorations. About a week ago he pulled all of our spooky stuff out of the garage and began thinking about where to put things. Tonight was the night! 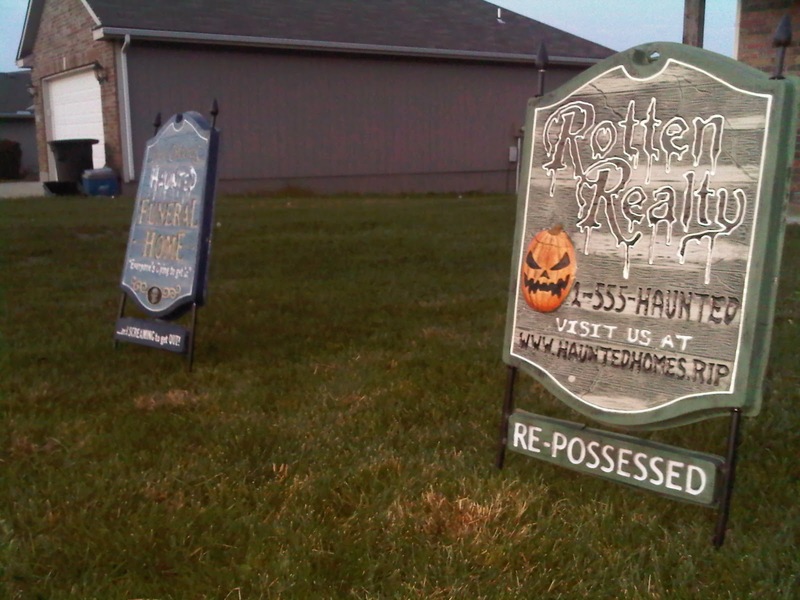 We assembled 2 tombstones and found the perfect spot for them in the yard...not too close to the street, yet close enough that people can read the writing. We stuffed 18 ghosts, attached them to sticks and lined them up like soldiers along our driveway. We pulled out the spiderwebs and the caution tape and then it hit us: none of our stuff is sturdy enough to last the 2 weeks until the big day. So we pulled the tombstones back out of the ground and moved the ghosts to a safe resting place until Halloween gets closer. You may be thinking that we wasted our time, and for a brief second I would have agreed with you. But you know what...we had fun! We were rushing around the yard trying to get the decorations in the ground before it got too dark to see what we were doing. We were working together to stuff paper towels into little bity ghosts. We were wondering out loud how long it would take the neighbors dog to eat or pee on our precious decorations. We were even still smiling as we picked everything back up and dragged it back in the house. No time is wasted that is spent with a smile. I enjoyed a cool fall evening hurrying to put up Halloween decorations and then immediatly hurrying to take them down...but I was smiling the whole time. When we put them back up in a couple weeks there will be no debating over the perfect spot for the tombstones because we already decided that this evening. When we came back in the house we ate some pumpkin spice pancakes for dinner and admired our cute inside decorations by the fireplace. The outside of our house may still need some work, but inside we are smiling and laughing at ourselves. I'm positive that next Halloween we will share some more laughs as we remind each other of this night.